The City of Costa Mesa will begin a four-month community outreach process Wednesday to generate public input on the update of its General Plan, which guides the city’s long-term growth and development. Over the course of 10 meetings and workshops, the city will solicit local input on various elements of the General Plan, including housing, land use and traffic circulation. The city’s General Plan is updated about once every 10 years. This will be Costa Mesa’s first General Plan update since 2000. The following is the schedule of General Plan meetings. Wednesday, May 15, 2013: Introduction to General Plan and Housing Element Workshop, 6 to 7:30 p.m., City of Costa Mesa Emergency Operation Center (EOC), 99 Fair Drive, Costa Mesa. You can read the staff report for this meeting HERE. Tuesday, May 28, 2013: Housing Element, Planning Commission meeting, 7 p.m., Costa Mesa Council Chambers 77 Fair Drive, Costa Mesa. Tuesday, June 4, 2013: Housing Element, City Council meeting, 6 p.m., Costa Mesa Council Chambers 77 Fair Drive, Costa Mesa. Wednesday, June 19, 2013: Land Use Alternatives, 6 to 7:30 p.m., City of Costa Mesa Emergency Operations Center (EOC) 99 Fair Drive, Costa Mesa. Wednesday, July 17, 2013: Circulation Alternatives, 6 to 7:30 p.m., City of Costa Mesa Emergency Operations Center (EOC) 99 Fair Drive, Costa Mesa. Wednesday, August 21, 2013: Preferred Alternatives, 6 to 7:30 p.m., City of Costa Mesa Emergency Operations Center (EOC) 99 Fair Drive, Costa Mesa. Wednesday, September 18, 2013: Policy Review, 6 to 7:30 p.m., City of Costa Mesa Emergency Operations Center (EOC) 99 Fair Drive, Costa Mesa. In addition to the workshops, monthly road shows will be held during business hours at various locations throughout the city. Wednesday, May 29, 2013: Meeting with Building Industry Association, time to be determined, Costa Mesa City Hall, Conference Room 1A. Wednesday, June 5, 2013: Meeting with Chamber of Commerce, 3 to 4:30 p.m., Costa Mesa City Hall, Conference Room 1A. Wednesday, June 26, 2013: Meeting with the Newport Beach Assn. 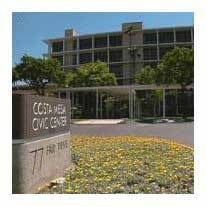 of Realtors (including Costa Mesa and Newport Beach), 9 to 11 a.m., Costa Mesa City Hall, Conference Room 1A. For more information, go to the city’s website (www.costamesaca.gov/generalplan) or call the Planning Division at (714) 754-5245. Perhaps the city will address the disproportionate amount of renters to homeowners, the West Side and overall condition of the city. It's always been maddening to me how a city so close to the beach could have a gang problem which seems to tie into the excessive amounts of apartments throughout the city. The ripple effect is what drives families out of the city seeking better schools and less problematic neighborhoods. Faye, cities close to the beach and even cities ON the beach are not exempt from gangs. From Pacific Beach in SD County, to San Clemente,HB, Venice and many more. I've lived on the Westside for over twenty years, I have never experienced or seen any evidence of a Gang problem, and I have never seen one neighbor move away for those reasons.On the other hand, over that same time period I have witnessed many older original home owners either pass away or move. Young families have snapped up those homes and cleared out the debris and really have made a huge impact. Can you name or do you know of ONE family that has been "driven out" ?, because this Westsider , and I know a few people, calls you out on your BS. Oceanside is another beach city with gang violence. Oh, and it's a charter city, too. San Clemente, Santa Monica and Oceanside have gangs, Faye. That's just to name a few. Granted the apartments here are a mess, building more "condos" to be rented out is not the solution. If you look at Canyon Drive, there is 10 units built on a deep lot, and there are probably 15 of those separate developments. They are condos and townhouses that some have rented out. The parking is horrible, they stretch into neighboring areas, and Fairview Park and Waldorf School as well as Victoria School. That is just over on the Westside. Then, there is Camino Real, in Mesa del Mar, with several blocks of apartments, with overcrowding, and not enough parking, so it stretches into the single family home areas. Its not just rentals, its density that should be looked at, and the parking. They want to build, and now even complain about the strict parking codes, but look at the mess that is being created. Personally, I believe this regime should concentrate on jobs, and bringing businesses into town. Fixing up the area that would attract businesses. Then the homes follow. Providing "affordable" (cheap) and cheesy housing is what they are trying to do, in order to make their developer friends happy. Would you say the gangs are not connected to drugs or shootings? I've not lived around long, but I have seen families bail out of the west side due to undesirables, crime, drugs, gang presence. Depending on the events of the next 5 years, I will decide also. I also have seen many familes choose not to live in CM due to those same issues. I'm not doubting your statement regarding young families making an impact, since I'm one fo them. But after more of the same, those families won't stay. You think they send their kids to Edison for fun? No James..I haven't seen "families bail out" of the Westside. I've seen the quiet streets with the ocean breezes thrive in the last five years, especially in the last five years. I've seen a greater sense of community . I've seen greater involvement and outreach with the hispanic community in the local PTA's. I've seen more and more people walking streets and riding bikes. I've seen more pride in home ownership and greater investment in remodels. Whoever is providing the talking points that the Westside is a "gang ridden slum", ONE, does not LIVE on the Westside, and TWO is a liar. Gericault, lets be fair. I can pretty much guarantee that you don't live near Rea School, or near the intersection of Maple and Joann. Oh, I didn't know we were being street specific ....when you use the term " Westside" you start " tarring" with a very wide brush. Is this your "bad neighborhood? "....Looks like many other areas in the city.